Mary Jane gets Lucy on "The Art Linkletter Show" as a special contestant. Lucy will win $500 if she can keep her cool for 24 hours, but if someone makes her lose her cool, they'll win the money. Unbeknownst to Lucy, Lucy's family and friends are in on the deal and try their hardest to make Lucy lose her cool. In the process of not getting angry, Lucy manages to demolish a grocery store. On the day after, Linkletter awards her $500. Then, the manager of the grocery store enters and charges her $499.99 in damages, leaving her with 1 penny! Lucy gets mad and cries until Linkletter reveals that her friends and family were in on the charade and awards her another $500, but this time in pennies. 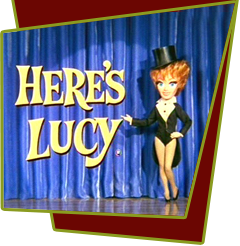 Special Notes: This episode seems to be a combination of I Love Lucy, episode #85 "Ricky Loses His Temper" and The Lucy Show, episode #100, "Lucy and Art Linkletter".